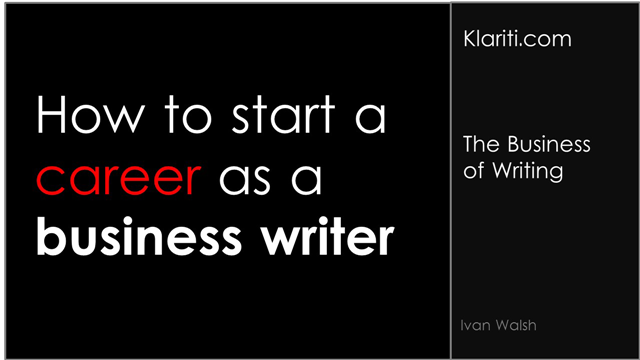 Let’s say you want to change careers and start as a business writer. Where do you start? What courses do you need to take? Is there a professional organization you should join? In most cases, no. Starting as a freelance business writer is more about starting a small business, which happens to be about business communications. If you see it like that, then it becomes more ‘do-able’. You just need to find the work, right? Gather samples – showcase your best writing samples, not everything. Remove dates. Get recommendations – contact people you’ve worked with and will vouch for you. If necessary, remind them that you’re looking for work as a business writer in case you worked in a different capacity with them. You’re not asking them to lie, but to stress your communication skills. Create portfolio – convert your sample materials into PDF. Format it so it’s easy to read, works well on small devices, and downloads fast. Remember to update the File Properties. In MS Word, this is in the File tab. Finding first lead – if you’re starting from scratch, contact local IT firms and see if you can help with their documentation needs. Likewise, go to local business events, such as The Chambers of Commerce and make connections there. Blog strategy – this is a low cost way to increase your reach, position yourself as an authority, and generate traffic, which hopefully become leads. Keep the blog focused. Write only about business writing. This is not a diary. Stay focused, offer useful tips, and position yourself. LinkedIn groups – join at least five LinkedIn groups where there are active discussions, not just self-promotional posts, and aim to be helpful. Answer questions, connect with others, and be patient. Then, when you post something on your blog, especially something very good, share it on the groups. Ask for feedback. Be receptive. Thank people who comment. LinkedIn posts – write short 300 word articles and post them on LinkedIn. At first no-one will read them but if you keep it up, they’ll get noticed. Link to your LinkedIn page and Twitter account. Quora – answer questions on Quora to show you’re expertise. Provide value. Every third answer link back to your blog. You can also create a blog on Quora and cross-post. Pricing – ask around and see what others charge. If you are starting out, reduce your rates a little but not too much. Otherwise, people won’t respect your efforts. Marketing your services – try to specialize in a few areas. Be the expert writer for this industry. If you go too wide, it’s hard to justify higher fees. Writing – learn how to write white papers, case studies, and reports as your potential clients will need these. Invest in your new career. Buy at least three books. Don’t be penny-wise, pound foolish. Guest post – if you decide to write on other sites to raise your profile, then write exceptional guest post articles. Really make them stand out. While you’re giving away great content, you’ll make new leads. There are no short-cuts here. Get out there, start connecting, and write frequently. PS – before I forget. Don’t try to jump straight into business writing. If you’re working 9-5, see if you can moonlight a little, do some work at the weekends, and build up a portfolio. That way you can establish yourself, create a network, learn your trade, and then, when the time is right, make the jump. PPS – three books worth reading.